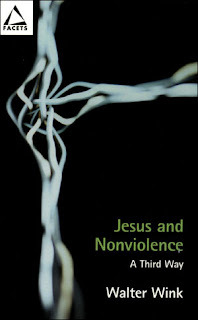 I just finished reading Jesus and Nonviolence: A Third Way by Walter Wink. Wink is a professor of Biblical Interpretation and Auburn Theological Seminary in New York. Another book he's written which is definitely on my list is called The Powers That Be: Theology for a New Millennium. Wink is a genius and a must read for anyone interested in liberation theology (not that he's a liberation theologian), Jesus & Empire discussions (not that he'd necessarily use the Empire language), or, in this case, nonviolence. "Violence simply is not radical enough, since it generally changes only the rulers but not the rules. What use is a revolution that fails to address the fundamental problem: the existence of dominion in all its forms, and the myth of redemptive violence that perpetuates it?" Therefore in all our work for social change, in all our revolutionary ambitions, and in siding with the oppressed we must embody God's Kingdom for the not only do the ends not justify the means but they desperately depend on them. Wink, though he seeks an alternative to violence does not promote the second option which we usually think of as the only other option: "flight." He seeks a radical new way, Jesus third way, which aggressively seeks change and empowers the oppressed to assert their humanity but also embodies a dominion of love, i.e. God's dominion. We must resist evil, he explains, but we must love our enemies and offer to them the gift of opportunity to be redeemed unto the oppressed. The third way is no less courageous than the way of violence (it may indeed be more so) in the pursuit of justice. Wink doesn't only deal in pragmatic examples (although he has plenty of examples) of the "effectiveness" of nonviolence but offers this option in a way that transcends effectiveness and "means and ends": "Means and ends coalesce as people create for themselves social instruments for change that already embody the better life they seek ahead" (page 102). "With Jesus a way emerges by which evil can be opposed without being mirrored" (page 27). This book was very helpful and I would highly recommend it to anyone who cares to embody the Kingdom of God here and now.